Physical education for the person with Down syndrome: More than playing games? Children and adolescents with Down syndrome have a range of physical problems and difficulties that may affect their motor development. Therefore it is important that programming which is directed towards facilitating motor skill development reflect quality practices. This article presents five elements regarded as demonstrating 'quality' in physical education and some guidelines for programming. It is considered that physical education programs need to provide learning opportunities which assist the individual with Down syndrome to go beyond the playing of games to become a physically educated person. Jobling, A. (1994) Physical education for the person with Down syndrome: More than playing games?. Down Syndrome Research and Practice, 2(1), 31-35. This paper describes the establishment of a 'state of the art' commercial greenhouse, where all the horticulture is carried out by adults with Down syndrome. These adults grew up at a time when the educational opportunities and social experiences available to them were extremely limited. This project has shown them capable of learning a range of new skills to a high level and it has brought them dignity, independence and enhanced their self-esteem. A video tape of the project is available from the author. Perera, J. (1994) It is never too late to learn to work: An experience with adults with Down syndrome developed in Majorca, Spain. Down Syndrome Research and Practice, 2(1), 36-39. The relationship between cognitive abilities and communication continues to be a topic of interest and argument. These theoretical debates in psychology and linguistics have a relevance to the way we plan intervention. A modular view of language suggests that intervention should be focussed on language itself. Cognitive views suggest that intervention should be more broadly based. In our research we have examined predictions from cognitive theories which suppose that there are particular relations between communications and cognition. The research concerned a small group of children with Down's syndrome who were visited every four weeks over a period of six months. Our findings provide some limited support for one of the cognitive theories; this implies a linking of communication and cognition during certain periods of development. Another notable feature of our findings was the delay in language production, relative to other abilities in children with Down's syndrome. Messer, D, and Hassan, P. (1994) Early communication and cognition in children with Down syndrome. Down Syndrome Research and Practice, 2(1), 3-10. 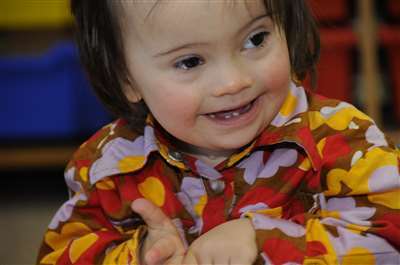 This article examines the perceptions and performance of a group of people with Down syndrome. This quality of life research is based on a six year study and compares the individuals' performance with others with developmental disabilities. Twenty-seven people with Down syndrome ranging in age from 18-43 took part in the project and received individually chosen intervention for the last three years of the study. Over the six years, their Verbal IQ increased significantly. They also made significant gains in applying reading, writing and numerical skills in social contexts. Surprisingly, social behaviour and performance in a work setting declined after community training according to the rating of service providers, suggesting that training leads to gains in behaviour which are useful in the community, but less valued in traditional agency services. Individuals tended to be more dissatisfied after intervention as they became more aware of their needs and therefore more critical of their environment. Brown, R. (1994) Down syndrome and quality of life: some challenges for future practice. Down Syndrome Research and Practice, 2(1), 19-30. Studies in infancy, teens and the mid-twenties were made of an original cohort of children with Down syndrome, born in the 60s and brought up at home in South Wales. The young people continued to improve in their self-care and daily living skills into adulthood, although no one had reached full independence. Studies were made in infancy and teens of a second comparative cohort of children with Down syndrome, born in the 70s and brought up at home in South Wales. In the teens, significantly more of the comparative cohort were independent in their self-care skills and daily living skills compared with the original cohort when they were in their teens, nine years earlier. It was not that there were individuals in the comparative cohort who were superior to individuals in the original cohort, rather there were far fewer in the comparative cohort with extremely limited achievements who were not reaching their potential. Shepperdson, B. (1994) A comparison of the development of independence in two cohorts of young people with Down syndrome. Down Syndrome Research and Practice, 2(1), 11-18.